IAESTE LC Hamburg Praktikavermittlung e.V. What? A nice get-together with other students who went on an internship abroad and of course the IAESTE Hamburg Team. Snacks and Drinks included. We would like to know how you internship was, what friends you made, how different the culture was and what else you were able to discover during your time abroad. So please bring some fotos, souvenirs and great stories to share with us. This is also a great opportunity to meet the IAESTE Team, if you are thinking about joining us. Visit OUR NEW APPLICATION PORTAL and fill in your preliminary application to get a shot at the best global internships next year. Application process always starts in November! Please follow our facebook page or regularly check this website for updates! Listening to different music and speaking in different languages. And yet, one magic word unites us all. To the bar tender, to the bus driver, to the old lady sitting at the diner next to you. Where else can you find a piece of home and yet have the freedom to experience the world?" - Cindy, international Student at the TUHH and one of our newest IAESTE members about why Hamburg is such a special and international place. Do you want to learn more about IAESTE and our internship programm? Or do you want to become part of our unique worldwide network by workink volunteerly for IAESTE Hamburg? Weekly meetup in our cozy IAESTE office with some new faces who are motivated to join. You want to enrich and upgrade your everyday university life? Join IAESTE now! We are volunteering students, connecting more than 80 countries all around the globe by representing the world’s largest platform for student internships in technology, science, and engineering. – AND: we want you to join! Why right now? Once a year, there’s a giant staff training in Munich. Packed with workshops and nice people, it’s the perfect way to get started! Perfect to get to know IAESTE and a bunch of new people. Costs? Food and accommodation are organized and free for IAESTE members. Plus, you can even get back your money for the commute! You want to get out of the box, make experiences outside the university and support other students? What are you waiting for! PS: even employees love volunteers ;) teamwork makes the dream work – so soft skills are essential. Come to our booth, Challenge yourself in 3 Levels and get a Chance to win an awesome internship abroad. Our Application period for internships in summer 2018 is now over. If you were one of the lucky ones to receive a job offer for an IAESTE internship in 2018 you now have to wait patiently for the acceptance letters of the employers. Please allow the receiving country as well as your future employer some time to forward and check your documents before you worry why you haven't heard of them yet. We are happy to announce that we received the list of all internships available for students in Germany. To take a look at this list please log into the registration platform (username=your e-mail, if you forgot your password click on "Passwort vergessen?"). On the platform you will find the overview of the available internship offers including a short description of the kind of work and the requirements. We recommend you to take some time to go through the list. We now need to know your preferred internship places! To vote, please select your choices for your wishlist. You can mark as many offers as you like. ATTENTION: Only choose places where you fulfill the requirements AND which you will definitly be able to participate in when you are accepted. You cannot apply for internships which are in your home country. We recommend that you tailor your letter to your favorite place/s - this greatly increases your chances for selection as this is what we use to decide who to nominate for the internship. Your letter is the only window into your personality. A good direction would be to answer questions like "Why did you choose IAESTE? ", "Why did you choose your favourite place/s? ", "Why should we send YOU abroad? ", "What do you expect from an IAESTE internship and our organisation/the employer?". The letter should NOT contain any personal details such as name, contact details or pictures of you. You now have time until 04.02.18 to reply. Be aware that there are more applicants than internship offers, so we cannot guarantee that everyone gets a place! This means also that you might get nominated for a place that was not your first choice. Therefore we kindly ask you to only name those offers that you are willing to accept! And be open minded for places in unusual countries. We will try to get your selected internships at the national exchange conference in mid-February. Afterwards we will inform you via e-mail whether you received an internship or not. Don’t worry if you didn’t receive an acceptance in the first round. There will be a second round of remaining offers that have not yet found a matching applicant. In case you have any questions about the internship offers, do not hesitate to ask! Sorry guys, unfortunately we made a big mistake in some newsletter mails and mixed up the deadline for this years IAESTE pre application. We are really sorry about this confusion! So for everybody who did not yet have a chance to fill out the online pre-application for an amazing IAESTE internship in 2018, we extended the deadline for another week. 200 SPARTANS DIDN'T HOLD THE PERSIANS AT BAY. WE NEED THE 300 !! Tell your friends that they need to invest only 5 minutes to do PAID INTERNSHIP ABROAD ! Don't miss out on the chance of a lifetime: Travel, paid work, technical experience, lifelong friends, international network of like-minded students and professionals. IAESTE has it all! You still haven't applied for an IAESTE internship in 2018? Don't worry, there is still some time to do so! It only takes ten minutes of time to fill in your contact details, study field and desired region and duration for the internship - so don't wait any longer and apply NOW! Do you love coffee? Do you want to travel the world? Do you want to gather some work experience? Do you want to push past your limits? Visit our Coffee booth to get all of this with our great IAESTE internships! What? Come around to get a cup of fresh coffee for free, meet the IAESTE Hamburg team and get all information about IAESTE internships abroad. Get some free coffee and boost yourself today. Learn more about IAESTE and boost up your whole life with an awesome internship abroad. Isn’t an exciting, enlightening and well-paid internship in a foreign country the dream of any student ? We, IAESTE Hamburg, offer YOU a shot at internships you won’t find anywhere else! Sounds unbelievable ? Try us! Applying now is only the first step - it helps us estimate the local demand for placements. In February 2017 we will get back to all applicants by email and start the matching process for the specific offers, we were able to acquire using your profiles. We hope you will wash us away in a massive turnout and we’re looking forward to your applications starting…NOW ! The registration period for internships in 2018 is starting soon but unfortunately you will have to be patient for just a little bit longer. If you have already applied using the old tool, don’t worry. We will get back to you if we need more information. Please understand that we have deleted all old profiles and therefore can't reset your password. Today is IAESTE Day - the day we make our mark on the world for IAESTE ! What's better than celebrating this special day with our IAESTE friends at the Freimarkt in Bremen? But seriously: Paid interships in international companies with mentoring for everyone is something you simply cannot get anywhere else ... for FREE ! So spread the word, link our facebook and stay tuned for the application period which starts very very soon ! Wow! What an awesome weekend. Thank you guys for making the HaWo such a great event. You were incredible and survived the no sleep challenge. We miss you guys alread! For all IAESTE trainees and members we still have a couple of spots left for the Hamburg Weekend 04.-06.08. Are you interested in doing an exciting and well payed internship abroad? Do you want to help us organise this experience for other students? If you are interested in more detailed information about IAESTE internships in general or the possibilities to participate in this organisation, come and see us at our info event. IAESTE stands for: International Association for the Exchange of Students for Technical Experience. As part of the international IAESTE network we, IAESTE Hamburg, facilitate internships in technology, science and engineering in more than 80 countries around the world, free of charge. For our members we are also offering team events, workshops and the possibility to meet new friends around the globe. Last night we had our very successful outgoing event "GO IAESTE"
We are happy to announce that we received the list of all internships available for students in Germany. For more information about the following procedure please check your emails and log in on our webpage www.iaeste-hamburg.de/apply . There you will find the overview of the available internship offers including a short description of the kind of work and the requirements. IAESTE LC Hamburg feat. IAESTE LC Aachen - Ehre sei IAESTE in der Höhe ! This year was less busy than last year even though the challenges Werke bigger. We worked hard to get as many applicants as possible - we learned what works and what doesn't. And of course we want to thank YOU , our followers - without your support, our motivation would've been hiding somewhere in the shadows but now it shines brightly. - "The employer is always right"
We will celebrate our Christmas Party with many committees from northern Germany on January 7th - see you then ! Due to high demand we re-opened the preliminary application until Saturday the 17th of december 23:59. Preliminary application is without obligation and you can choose whether you apply for an internship of our list or not by the end of january. 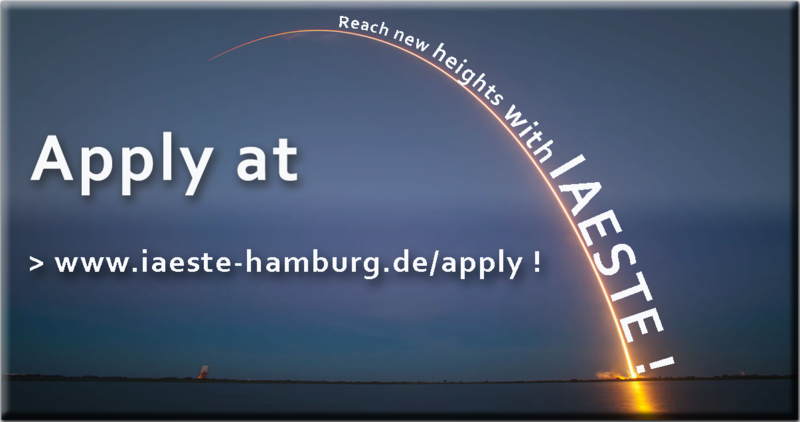 Step 1: Go to www.iaeste-hamburg.de/apply and register with your contact details. You will get an E-Mail to activate your account. Step 2: Log in with your credentials. Go to "personal details" on the left and check your contact details, tick the box "approved" and submit those details. Step 3: Now you can go to "Application Status". Here you have to give information about your field of study and internship details. Click on Submit and you will get a notice that your application is transferred to us. Don't worry you do not have to donate to our cause for a valid application. Come to the BLUE side ... Apply now ! Visit http://www.iaeste-hamburg.de/apply and fill your preliminary application to get a shot at the best global internships next year. Tell all your friends (those who aren't boring ;) that every application increases the chances for EVERYONE to get a great internship ! Do you wonder why we do this ? Get to know us at our weekly meetings every Monday 6 p.m. ! Drop us an email if you have any questions. Hello to everybody who is unpatiently waiting for the employer's approval! Currently just one of 27 outgoers from Hamburg has received his acceptance letter by the foreign employer. We expect to receive the other acceptance letters in the coming weeks. This is perfectly normal, as IAESTE is a huge international organisation. Launch yourself to new heights with an IAESTE internship! As every year we hope to have many registrants since that increases the number of internship offers Hamburg receives ! Here's how to write your report! Finished your internship 2015? We hope you had a great time and returned home safely! Please hand in your reports up to 4 weeks after return. Thanks for a great IAESTE Hamburg Weekend to our interns from all over the world who are currently working in Germany. We had a wonderful time! Go IAESTE! Wir suchen DICH! internationalen Menschen zusammenzuarbeiten und deine Englischkenntnisse zu verbessern? Bürobetrieb bekommen wir vom DAAD (Deutscher Akademischer Austauschdienst). IT, und das Verwalten der Finanzen. Dabei kommt der Spaßfaktor nicht zu kurz!!! der Quelle für Praktikumsplätze im Ausland. einfach kurz unter info@iaeste-hamburg.de mit. Wir freuen uns über dein Interesse, bei IAESTE Hamburg mitzumachen! you will find our current submission office hours on the left of our homepage. Please give us head notice if you plan to come on a specific day so we can open the middle door which is usually closed due to security reasons. Application Period half time! Apply NOW ! Share our post and up the game for the coming IAESTE application cycle! das IAESTE LC Hamburg ist stolz, einen neuen Kooperationspartner in der Metropolregion Hamburg gefunden zu haben: die GoodGame Studios GmbH ! Goodgame Studios ist die am schnellsten wachsende Spieleschmiede Europas. Seit der Gruendung im Jahre 2009 ist der Spieleentwickler auf die Groesse von stolzen 900 MItarbeitern angewachsen - ueber 200 Millionen Spieler auf der ganzen Welt spielen die Spiele von Goodgame Studios. Dieser Erfolg ist nicht unbeachtet geblieben - Goodgame Studios haben 2011 den "Entrepreneuer of the Year Award" gewonnen. Dazu kommen der “European Games Award”, der “BÄM! Award” und im Jahr 2013 drei Publikumspreise unter “MMO of the Year 2013” in den Kategorien “Bestes Portal”, “Bestes Strategie Browser MMO” und “Bestes Freizeit Browser MMO”. Wir moechten im gleichen Zuge alle Follower dazu anhalten, uns zu helfen, neue Kooperationspartner zu finden. Als eingetragener gemeinnuetziger Verein wollen wir den Hamburger Studierenden ein groesseres Angebot an Praktikumsplaetzen anbieten - doch dazu brauchen wir viel mehr Praktikumsplaetze hier in Hamburg! Wir sind offen und ganz Ohr fuer jeden Unternehmensvorschlag, jeden Lead, jeden Kontakt. Das IAESTE Austauschprogramm kostet ein kooperierendes Unternehmen nichts - erst wenn ein Bewerber fuer ein Praktikum akzeptiert wird, entsteht der Betreuungsaufwand - welcher meist genau so hoch ist wie fuer einen Praktikanten aus Deutschland. Wir moechten GoodGame Studios unseren Dank aussprechen und freuen uns auf eine fruechtetragende Zusammenarbeit! Für alle die immer noch keinen Platz abbekommen haben gibt es jetzt die inzwischen siebte Pool-Liste. Die Liste umfasst 133 Angebote aus über 30 Ländern, für die wir Bewerber suchen. Es sind wieder mehr Plätze im Angebot, da bis jetzt Bewerber ihr Praktikum abgesagt haben oder abgelehnt wurden. Also könnte mit Glück wieder einer eurer früheren Wunschplätze dabei sein. Zusätzlich lohnt es sich immer wieder in unsere Sprechstunde zu kommen und auf unsere Homepage zu schauen, da in unregelmäßigen Abständen immernoch weitere neue Praktikaangebote auftauchen, die wir auf die Homepage stellen werden. We have published a very exciting offer for HVAC-Engineers in the field of heat, ventilation, climate and sanitary technology near Zürich in Switzerland starting in spring/summer 2014 for 52 weeks. Looking forward to a nomination (including portfolio). für alle die noch einen Sprachtest für den Fahrtkostenzuschlag ablegen müssen gibt es nun einen zweiten Termin. Am 12.4 finden die Sprachtests von 9-14 Uhr im 20 Minuten Takt im Von Melle Park 5 statt. Schickt uns bitte bis zum 9.4 mindestens einen Termin zu, der euch passt. Für alle die immer noch keinen Platz abbekommen haben gibt es jetzt die inzwischen sechste Pool-Liste. Die Liste umfasst 120 Angebote aus über 30 Ländern, für die wir Bewerber suchen. So nun ist das auch schon wieder eine Woche her. Wir haben alle Bewerbungen, die bis zum 26.3 abgegeben wurden, durchgeguckt und auf Vollständigkeit geprüft. Das war mal wieder viel Arbeit und deshalb freuen wir uns natürlich auch wenn einige von euch Lust haben bei uns mitzuhelfen und einen Blick hinter die Kulissen zu werfen. Falls ihr Lust habt, meldet euch einfach per Mail bei uns oder sprecht uns auf dem Campus an. Mitarbeit bei IAESTE ist aber nicht nur Arbeit, auch der Spaß und gemeinsame Aktivitäten sollen nicht zu kurz kommen. We have published a very exciting offer in Mechanical Engineering or Microtechnics with Johnson&Johnson in the French speaking part of Switzerland starting in January 2015 for up to 51 weeks. I am happy to propose you a very interesting placement within one of the biggest Architecture offices within Switzerland – the office is right in the centre of the nice city of Lausanne in the French speaking part. der Nachtausch war erfolgreich und wir konnten einige Plätze für euch ergattern. Wenn euer Platz dabei war, haben wir euch eine Mail geschickt. wir waren am 13.02. und 14.02. auf der nationalen Tauschkonferenz in Bonn um Eure Wunsch-Praktikumsplätze mit den anderen LCs einzutauschen. Sie war auch ein voller Erfolg, da wir mit ca. 34 Wunschplätzen von 50 Plätzen nach Hamburg zurück gekommen sind. Jeder, der sich in diesem Jahr für ein IAESTE Praktikum beworben hat, sollte mal seine/ihre E-Mails checken. Wir haben euch die Platzliste für dieses Jahr geschickt. Ihr habt noch 4 Tage Zeit eure 5 Wünsche per Mail an uns zu schicken. Es sind in den letzten Tagen schon ein paar early offers bei uns eingetroffen. Das heißt, dass diese Praktika schon in den Monaten Februar bis April starten. Einige in den Fachrichtungen Maschinenbau, Informatik, Chemie etc. in China und ein Maschinenbauplatz in Dänemark. Bei Intresse könnt ihr gerne einfach mit Vorankündigung per Mail in unserer Sprechstunde vorbei schauen. Eine unserer Infoveranstaltungen in diesem Jahr ist aufgezeichnet worden und steht ab sofort hier online bereit. Ab Minute 18:50 erzählen euch unsere Mitglieder Arne und Ina die Rahmenbedingungen und den groben Ablauf einer Praktikumsbewerbung. Bei Rückfragen könnt ihr euch gerne jederzeit an uns wenden! Achtung, es geht wieder los! An alle Hamburger S tudierenden: es geht wieder los! Wir hoffen auf rege Teilnahme und erwarten im November eure Bewerbungen! Zum zweiten mal konnte das IAESTE LC Hamburg diesen Sommer Trainees aus aller Welt in unserer schönen Hafenstadt begrüßen. Mit einer 20 köpfigen Gruppe haben wir noch einmal das schönste Sommerwetter an Elbstrand, Hafen und Alster genießen können. Auf dem Programm standen traditionsgemäß die Stadtführung über Rathausmarkt, Speicherstadt und Hafenfähre sowie eine Kneipentour durch das bekannte Schanzenviertel. Im Anschluss folgte eine Nacht bis in die frühen Morgenstunden um das aufregende Nachtleben von St. Pauli und seinem berühmten Fischmarkt kennenzulernen. Am neuen Morgen fand das HaWo 2 mit der Besichtigung der Michaelis Kirche und dem Hamburg Museum ein schönes Ende und unsere Trainees traten mit etwas Schlafmangel aber hoch zufrieden die Heimreise an. IAESTE local committees of Hamburg, Bremen, Göttingen, Hannover, Kiel, Lübeck, Lüneburg and Oldenburg form Regio Nord and organize summer program for the trainees in Northern Germany. In the Regio Nord webpage you can find more information about the summer program and register to the weekend trips each LC organizes. Here you can see all the IAESTE weekends in Germany and find some useful links. IAESTE Hamburg is especially looking forward to the Hamburg Weekend No2 from September 6th–8th. Invitation as PDF is here. The registration to the weekend has now started. The number of participants is limited to 20 people so register quickly! You can find the information for registration in the Regio Nord webpage. We are looking forward to seeing you in Hamburg, one of the most beautiful and exciting cities in the world! Das LC Kiel hat ein schönes Wochenende am 19.-21. Juli organisiert. Trainees aus Kiel, Hamburg, Bremen, Hannover, Braunschweig, Göttingen und Jena sind auf der Ostsee gesegelt und haben ausgiebig das heiße Wetter am Strand genossen. Außerdem haben wir auch Husum und St. Peter-Ording an der Nordsee besucht. Das Wochenende war echt toll und wir warten schon auf die nächsten Regio Nord Wochenenden! Am 6.-8. Juli haben drei Praktikantinnen aus Hamburg am Bremen-Wochenende teilgenommen. Zu den Unternehmungen gehören unter anderem eine Tour durch die Beck's Brauerei, Fußballspielen im Sportgarten und eine Stadtrundfahrt durch die wunderschöne Innenstadt von Bremen. Uns Praktikantinnen hat das Wochenende sehr gut gefallen und wir können nur sagen - Danke LC Bremen! Vom 21.6. bis zum 23.6.2013 lud IAESTE Hamburg zum HaWo ein. Dieses Jahr konnten wir 17 Leute bei uns in Hamburg, der schönsten Stadt der Welt, willkommen heißen. Möchtest Du neben dem Studium internationale Erfahrungen sammeln, dich engagieren und vor allem Spaß dabei haben? Dann musst Du uns unbedingt kennenlernen! Wir stellen uns Dir gerne am Donnerstag den 13.6. bei gemütlicher Atmosphäre und gemeinsamem Grillen vor. Komm einfach ab 19 Uhr zum HCU International House (Averhoffstr. 38). Du wirst nicht nur erfahren, dass wir ein studentisch organisiertes Team sind, ehrenamtlich arbeitet und sowohl dem DAAD angehört als auch Teil einer der weltweit größten studentischen Organisationen für die kostenlose Vermittlung internationaler Praktika im technischen sowie ingenieur- und naturwissenschaftlichen Bereich sind. - vor allem, weil es SPAß macht! - jeder sollte eine Chance auf internationale Erfahrungen haben! - neue Kontakte aus aller Welt! - einfacher Weg zum Praktikum! - Pluspunkt im Lebenslauf, etc.! Bitte meldet euch an, so dass wir mit die Grillvorräte abschätzen können: iaeste@hcu-hamburg.de. An alle Hamburger Studierenden: es geht wieder los! hättet ihr nicht Lust, ein erlebnisreiches, bezahltes und lehrreiches Praktikum im Ausland zu absolvieren? Bei uns gibt es das kostenlos! Bewerbungsphase für 2013 ist im November 2012. IAESTE heißt: International Association for the Exchange of Students for Technical Experience. Wir, das IAESTE Komitee in Hamburg, vermitteln als Teil des internationalen IAESTE-Netzwerks Fachpraktika für technische, ingenieur- und naturwissenschaftliche Bereiche in über 80 Ländern der Welt. In der Regel beträgt die Laufzeit eines Praktikums 2 bis 3 Monate, vorzugsweise zwischen Juli und Oktober; aber auch kürzere und längere Praktika sind möglich. Die Bezahlung deckt die Lebenshaltungskosten vor Ort. IAESTE Deutschland hilft bei der Beschaffung von Aufenthalts- und Arbeitserlaubnis. Unterstützt und gestaltet wird der Aufenthalt durch das IAESTE Komitee des jeweiligen Gastlandes, welches auch Unterbringung und Kulturelles Programm organisiert. Am zweiten Juni Wochenende flog das LC Hamburg mit einer kleinen Boeing 737 zum Twinning Gegenbesuch nach Edinburgh, Schottland. Bereits am Flughafen wurden wir von den Gastgebern herzlichen in Empfang genommen und schonend durch eine Doppeldeckerbusfahrt zum Hostel auf den Linksverkehr vorbereitet. Es wurde ein Wochenende voll mit kulturellem Austausch in vielerlei Hinsicht. Nach unserer Ankunft stürmten wir erst die wunderschöne mittelalterliche Burg von Edinburgh und anschließend die vielen Pubs, die die Stadt zu bieten hat. Beim Whiskeytasting am Abend lernten wir, abgesehen von noch mehr schottischer Kultur, weitere LC Mitglieder sowie einige Praktikanten aus vielerlei Ländern kennen. Gut gestärkt und vorbereitet ging es dann auf zur eigentlichen Attraktion des Abends: Zum traditionell schottischen Ceilidh (ausgesprochen: Kay-lee) tanzen bis weit in die Nacht herein. Am Samstag wurden die Höhen und Tiefen der Stadt weiter erkundet. Angefangen mit dem Village und dem schönen Flüsschen Water of Leith bis hin zu der phenomenalen Aussicht über die Stadt vom Scotts Monument. Mittags zeigte sich Schottland von seiner schönsten Seite und wir konnten beim Picknick im Princess Garden in der Sonne baden. Es kam sogar zu einem kleinen Sonnenbrand. Nach einem Spaziergang um Arthur’s Seat, eine bekannte Erhöhung neben der Stadt, herum gab es ein Abendessen im ältesten Pub Schottlands. Anschließend war es natürlich unsere Pflicht den Sieg Deutschlands gegen Portugal live mitzuverfolgen. Der Sieg musste natürlich gefeiert werden…..
Am nächsten Morgen ging es auf nach Glasgow. Auch dort wurden wir nett vom LC Glasgow und seinen vielen Praktikanten empfangen. Die Stadtführung wurde uns leider durch den Regen ein bisschen vermasselt. Jedoch war der Besuch der Universität (Hogwarts lässt grüßen!!!) den Aufstieg Wert. Apropos Hogwarts, nach den kalten Regenschauern in Glasgow mussten wir uns in Edinburgh erst einmal in einem Café aufwärmen. Dabei nahmen wir uns ein bekanntes Vorbild und wählten das Café, welches auch J.K. Rowling bereits nutze um ihrer kalten Wohnung zu entfliehen und Harry Potter zu schreiben. Nach einem Abschiedsdrink (oder auch zwei, oder drei...) mit den beiden LCs in Edinburgh ging es am Montagmorgen in aller Herrgotts-frühe schon wieder nach Hamburg. Wir hatten alle viel Spaß und haben durch die engagierten Gastgeber, ganz im Sinne von IAESTE zusammen mit unseren ortsansässigen schottischen Freunden, auch viele schöne Eindrücke von dem Land sammeln können. Am Wochenende vom 1.6. bis zum 3.6.2012 findet bei uns in Hamburg das diesjährige LC-Treffen statt. Die Planungen laufen auf Hochtouren und bald ist auch der Internetauftritt fertig. Damit wir an dem Wochenende nicht alleine hier sind werden wir in den nächsten Tagen auch die Einladungen verschicken. Insbesondere werden wir am 1. Mai die Anmeldung für das Treffen freischalten. Außerdem existiert bereits eine Facebookgruppe "LC-Treffen Hamburg 2012". Nachdem das LC Hamburg im vergangenen Herbst erstmals an TUHH, HAW, Uni Hamburg und HCU Info-Stände zum Auslandspraktikum gemacht hat, haben sich fast 300 Studierende vorläufig beworben. Entsprechend groß war die Anzahl der Praktikumsplätze, die wir anbieten konnten. Viele eher „exotische“ Praktikumsplätze konnten in der ersten Runde allerdings leider keinen Abnehmer finden. Im Nachtauschverfahren konnten dann aber noch viele Plätze vermittelt werden, sodass letztendlich rund 50 Hamburger Studierende für ein Praktikum im Ausland nominiert werden konnten, undzwar für: Argentinien, Brasilien, Kolumbien, Kanada, Türkei, Arabische Emirate, Tunesien, Oman, Ghana, Ägypten, Thailand, Korea, Indien, Japan, Ukraine, Großbritanien, Russland, Serbien, Norwegen, Estland und Spanien. Nun hoffen wir, dass sich die Arbeitgeber schnell zurückmelden. In der Zwischenzeit planen wir ein Interkulturelles Seminar, zu dem wir alle diesjährigen „Outgoer“ und alle diejenigen, die im letzten Jahr mit IAESTE im Ausland waren einladen, um die Erfahrungen auszutauschen. Details dazu folgen in den nächsten Wochen! Das IAESTE Team sucht Verstärkung! Das Outgoing-Verfahren (d.h. die Vermittlung der Hamburger Studierenden ins Ausland) ist für dieses Jahr abgeschlossen und es geht mit großen Schritten auf den Sommer zu. Ab Mitte Mai/Juni kommen die ersten Praktikanten aus dem Ausland nach Hamburg. Das bedeutet, wir leiten einige organisatorische Dinge in die Wege, kümmern uns um Wohnungen/Wohnheimplätze und bereiten ein buntes Sommerprogramm vor! Parallel organisieren wir allerdings gerade ein größeres Event, für dessen Vorbereitung und Durchführung wir noch tatkräftige Unterstützung brauchen. Am Wochenende 1./2./3. Juni kommen rund 80 IAESTE Mitglieder der unterschiedlichen Lokalkomittees der deutschen Hochschulen nach Hamburg für das alljährliche "LC-Treffen". Mitarbeiten könnt ihr in den Bereichen IT, Sponsoring, Öffentlichkeitsarbeit, Verpflegung, Freizeitprogramm, Design, Logistik und Workshopbetreuung. Studierende aller Hamburger Hochschulen sind herzlich Willkommen! Wir treffen uns jeden Dienstag im AStA Info-und Beratungszentrum an der HAW/Berliner Tor. Am Wochenende vom 10. bis 12.2. haben wir das LC Glasgow bei uns zu Besuch gehabt. Da kam uns das Alstereisvergnügen gerade recht! Nachdem unsere schottischen Freunde ihr Hostel am Hbf bezogen und in Begleitung erste Eindrücke von der Stadt gesammelt hatten, haben wir den Freitagabend gemeinsam im Hofbräuhaus gestartet. Danach ging es quer über die zugefrorene Alster zurück zum Hbf und dann ab zum Kiez. Den Sonntag über gab es ein lockeres kulturelles Programm ,u.a. mit einer Rathausführung. Abends sind wir nochmal zusammen im „Kartoffelkeller“ essen gewesen. Ein wirklich sehr nettes Restaurant in Hafennähe, welches extra für uns am Abend noch seine Türen geöffnet hat. Alles in Allem war es ein sehr unterhaltsames Wochenende, sowohl für unsere Gäste wie auch für uns... Wir hoffen noch dieses Jahr einen Gegenbesuch organisieren zu können! Neuer Raum und neue Mitglieder – IAESTE Hamburg wächst! 2012 scheint ein tolles Jahr zu werden! Es stehen einerseits eine Menge Vorhaben an und andererseits freuen wir uns, dass wir dabei von unseren neuen Mitgliedern tatkräftig unterstützt werden! Nachdem wir in den letzten Jahren zwar immer auf reges Interesse für unsere Sache – die ehrenamtliche Vermittlung und Unterstützung bezahlter Fachpraktika im Ausland – gestoßen sind, scheint dieses Jahr allerdings ein Rekordjahr zu werden. Mit nicht weniger als 300! Bewerbern aus Hamburg hat sich deren Zahl sage und schreibe verdoppelt! Um diesem Zuwachs an Interesse gerecht zu werden, haben wir uns einiges vorgenommen und da trifft es sich sehr gut, dass auch das Interesse an der aktiven Mitarbeit bei uns gewachsen ist! Unser Team hat sich in den letzten Wochen fast verdoppelt! Nach unserem Mitgliederzuwachs haben wir uns also entschlossen neue Arbeitsgruppen zu bilden, wobei sich viele Neuzugänge nun in der Gruppe „Firmenwerbung“ engagieren. Wir wünschen dabei viel Erfolg! Eine weitere Arbeitsgruppe befasst sich mit der Organisation eines Großereignisses, welches im Sommer stattfinden wird: IAESTE Hamburg wird dieses Jahr Gastgeber des LC (Local Committee) – Treffens sein, bei dem sich Mitglieder von allen LCs aus ganz Deutschland treffen. Wir erwarten ca. 80 Gäste, die - soviel steht schon fest - in der Jugendherberge an den Landungsbrücken untergebracht werden. Auch ein neuer Raum für unsere Arbeitstreffen steht uns zur Verfügung: Wir können nun das „ASTA Informations- & Beratungszentrum“ an der HAW HAMBURG nutzen! Außerdem werden wir Sprechstunden an der HAW anbieten (die genauen Zeiten stehen noch nicht fest, werden aber bald hier auf unserer HP bekannt gegeben). Unserem hochschulübergreifenden Team stehen nun also Räume an der TU HAMBURG-HARBURG, der HCU und an der HAW zur Verfügung. Das „International House“ der HCU werden wir dabei für größere Veranstaltungen nutzen, unser Büro an der TU für Büroarbeit (wie der Name schon sagt) und Sprechstunden. Ihr seht bei uns ist viel los im Moment! Falls jemand bei uns mitmischen möchte...schreibt uns einfach eine Mail und schaut vorbei! Wir freuen uns immer auf neue offene und interessierte Studenten! IAESTE Hamburg bietet international unbegrenzte Möglichkeiten und jede Menge Spaß!!! Wir sind als Lokalkomitee in Hamburg Teil der internationalen Organisation IAESTE (International Association for the Exchange of Students for Technical Experience). Unser Ziel ist es, Studierenden technischer Fachrichtungen kostenlos bezahlte Praktikumsplätze im Ausland zu vermitteln, sowie die Betreuung ausländischer Praktikanten in Hamburg sicherzustellen. In diesem internationalen Umfeld lernt man viele interessante Menschen kennen, hat die Möglichkeit seine Englischkenntnisse zu verbessern und kann natürlich selbst durch Praktika, Veranstaltungen und Konferenzen national und international Erfahrungen sammeln. Zu unseren Tätigkeitsfeldern gehören u.a. die Durchführung der Bewerbungsprozedur in Hamburg, Öffentlichkeitsarbeit, Einwerben von Praktikumsplätzen, Finanzverwaltung, IT oder die Organisation von Unterkünften. Besonders viel Spaß machen vor allem Veranstaltungen wie z.B. unsere Hamburg-Wochenenden und sonstige Aktivitäten um unseren Praktikanten hier einen möglichst abwechslungsreichen und schönen Aufenthalt zu bieten! Wir arbeiten ehrenamtlich und bilden ein hochschulübergreifendes Team mit Studenten von der HAW, HCU, TUHH und der UHH. Finanzielle Unterstützung für die Praktikantenbetreuung und unseren Bürobetrieb erhalten wir vom DAAD (Deutscher Akademischer Austauschdienst). Unsere Treffen finden alle 1-2 Wochen in Mundsburg, Harburg oder in der Innenstadt statt. Über neue Mitglieder freuen wir uns immer sehr! Wir laden Euch herzlich zu unserer Infoveranstaltung am Donnerstag, den 15. Dezember um 18:30 Uhr im International House der HCU in Mundsburg ein (Averhoffstrasse 38, Innenhof). Schreibt bei Interesse einfach eine E-Mail. Erlernen neuer Fähigkeiten im Bereich Organisation, Projektplanung etc. Möglichkeit zur Teilnahme an Seminaren/ Schulungen und anderen Treffen die vom DAAD getragen werden. Als Mitglied sitzt Du an der Quelle für Praktikums-Plätze im Ausland und bei der Vergabe von Plätzen wirst Du selbstverständlich bevorzugt. Deinem Engagement sind keine Grenzen gesetzt, so dass du bei uns sehr schnell etwas bewegen kannst. Jeder bringt sich je nach seinen Interessen so ein, wie er es selbst für richtig hält. Je mehr Leute sich aktiv beteiligen, um so weniger Arbeit ist es für den Einzelnen! Wir treffen uns jeden Donnerstag um 19 Uhr. Gäste / Interessierte sind wie immer herzlich willkommen! hättet ihr nicht Lust, ein erlebnisreiches, bezahltes und lehrreiches Praktikum im Ausland zu absolvieren? Bei uns gibt es das kostenlos! Bewerbungsschluss ist der 30. November. Bewerbt euch jetzt ganz unverbindlich (Bewerbungsformular), damit wir den Bedarf für Hamburg abschätzen können. Erst im Februar 2011, wenn uns konkrete Angebote vorliegen, ist eine endgültige Entscheidung notwendig. Bei Fragen könnt ihr unter Outgoing nachlesen oder uns eine E-Mail schreiben! Wir hoffen auf rege Teilnahme und erwarten eure Bewerbungen! Achtung: die Bewerbungsphase an allen Hamburger Hochschulen beginnt! Die IAESTE Info-Woche findet in diesem Jahr vom 31.10.2011 bis 04.11.2011 statt. Wir werden mit unserem schicken Messestand an den Hamburger Hochschulen unterwegs sein und eure Fragen beantworten, eure Bewerbungen entgegennehmen und hoffen auch neue Mitglieder motivieren zu können! Die „International Association for the Exchange of Students for Technical Experience“ – kurz: IAESTE Hamburg stellt sich vor! IAESTE vermittelt schon seit 60 Jahren bezahlte Fachpraktika in technischen, ingenieur- und naturwissenschaftlichen Bereichen. Wir sind weltweit vernetzt, möchten den kulturellen Austausch fördern und einen Beitrag zur weltweiten Völkerverständigung leisten. Mit dem DAAD als Dachorganisation wird unsere lokale Betreuungsstelle in Hamburg durch ehrenamtlich tätige Studierende von HCU, TUHH, Uni Hamburg und HAW getragen. Jährlich bewerben sich über 100 Interessenten bei uns, um ein Auslandspraktikum in einem der über 80 Partnerländer zu absolvieren – wie zum Beispiel bei Siemens in Indien, in einem Architekturbüro in Israel, in der Elektro- industrie in Südkorea oder im Informatikinstitut einer Universität in Polen. Neben dem Vermittlungsprozess ins Ausland betreuen wir auch ausländische Studierende während ihres Praktikums in Hamburg und organisieren internationale Events sowie ein regionales Sommerprogramm. In diesem Zusammenhang sind wir der Hafencity Universität sehr dankbar, dass wir im kommenden Monat unsere neuen Räumlichkeiten im „International House“ beziehen können, die speziell für Studentische Initiativen im internationalen Kontext am Standort Mundsburg/ Averhoffstrasse hergerichtet wurden. Über kommende Veranstaltungen informieren wir an dieser Stelle. Wir hoffen, in diesem Jahr erneut, Studierende für unsere Organisation begeistern zu können!